The phone rings in the California home of businessman Nate Michaels before the sun is up on October 24, 1962. An hour later he’s on an Air Force jet to Washington. 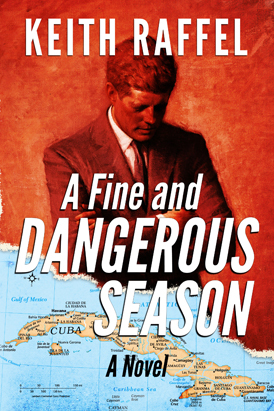 Michaels hasn’t seen or spoken to President Kennedy since they met at Stanford in the fall of 1940, but now JFK needs his help opening a back channel to defuse the threat posed by Soviet missiles in Cuba. In both the Pentagon and the Kremlin, pro-war generals want a showdown, not a humiliating compromise. As the world races toward nuclear holocaust in a fine and dangerous autumn, Michaels finds himself spinning in a maelstrom of statecraft, espionage, love, and betrayal. Here's an MP3 file of Keith reading the 1st two chapters of A Fine and Dangerous Season.